Shoes, boots and sandals with high heel, manufacture in a 10cm height of heel last. All of our styles are manufacture by order and are hand-made in Spain with first quality materials. High heels directly from factory.We manufacture with a 4” last heel since 35 size to 46 size, could be customizable by customer the design, colour and material. Exclusively our designs are manufactured by order, with first quality materials and handcraft process. We manufacture and sell directly to public without intermediaries.On this section we would like to show you a larger catalogue of sandals manufactured in leather with a high heel of 10cm of height, (the height could be depending of the size from 9,5cm on size 35 to 12cm on the size 46).Our sandals are based in a classic style of high heels trying to respect the most fetish styles and designs. In order to obtain a more refined line in our styles of high heels footwear, we look for a perfect balance between lines and heights. But all of them could be modify to the customer requirement as in colour as in material. As well we could manufacture exclusive designs and made-to-measure with the own measures of customer to achieve perfect fit.You should consider that the heights will vary according to size, and as we work with natural materials the colours should be a variation too. As well the resolution of the computer could show you a different tone on colours.Because our shoes are made on inquiry do not accept returns, each article includes a table of heel heights and measures last (this table is available in the download area of each item), if you have any doubts about your size please we advise you to consult us without obligation. Exclusively our designs are manufactured by order, with first quality materials and handcraft process. We manufacture and sell directly to public without intermediaries.On this section we would like to show you a larger catalogue of shoes manufactured in leather with a high heel of 10cm of height, (the height could be depending of the size from 9,5cm on size 35 to 12cm on the size 46).Our shoes are based in a classic style of high heels trying to respect the most fetish styles and designs. In order to obtain a more refined line in our styles of high heels footwear, we look for a perfect balance between lines and heights. But all of them could be modify to the customer requirement as in colour as in material. As well we could manufacture exclusive designs and made-to-measure with the own measures of customer to achieve perfect fit.You should consider that the heights will vary according to size, and as we work with natural materials the colours should be a variation too. As well the resolution of the computer could show you a different tone on colours.Because of our shoes are made on inquiry do not accept returns, each article includes a table of heel heights and measures last (this table is available in the download area of each item), if you have any doubts about your size please we advise you to consult us without obligation. Exclusively our designs are manufactured by order, with first quality materials and handcraft process. 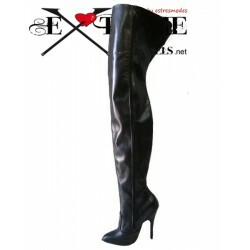 We manufacture and sell directly to public without intermediaries.On this section we would like to show you a larger catalogue of ankle boots, knee boots and thigh high boots manufactured in leather with a high heel of 10cm of height, (the height could be depending of the size from 9,5cm on size 35 to 12cm on the size 46).Our boot's legs are manufactured with first quality leather selected by the best leather suppliers, the boots are not manufactured in several pieces only are choosen in two pieces for make them. They are in standard measures to adapt them to most of legs, getting up to the thigh and getting a touch without side seams that leather lovers feel a high level of sensations.You should consider that the heights will vary according to size, and as we work with natural materials the colours should be a variation too. As well the resolution of the computer could show you a different tone on colours.Because of our shoes are made on inquiry do not accept returns, each article includes a table of heel heights and measures last (this table is available in the download area of each item), if you have any doubts about your size please we advise you to consult us without obligation. Leather court shoes 4" heel.